Bernard Frenay is Chief Financial Officer for the Euroclear Group and a member of the Euroclear SA Management Committee. As Chief Financial Officer, Mr Frenay’s role covers management responsibilities across a range of finance-related disciplines, including accounting, financial control, financial analysis, planning and reporting. 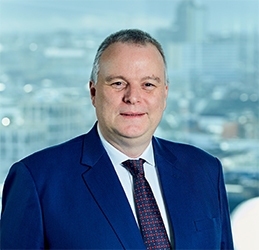 Prior to taking up his current responsibilities he was Managing Director and Head of Finance for the Euroclear group and also a member of the Euroclear Extended Management Team. Before joining Euroclear in December 2009, Mr Frenay was Deputy Chief Financial Officer at BNP Paribas Fortis in Brussels. Mr Frenay’s 20-year career includes experience in accounting, consolidation, financial projects, performance management and asset/liability management. Mr Frenay holds a Bachelor Degree in Business Administration from ICHEC (Belgium).